[268 Pages Report] The global market size of chlor-alkali is estimated to reach USD 102.60 Billion by 2021 and is projected to register a CAGR of 5.4% between 2016 and 2021. The report segments the market by chlor-alkali products, namely, chlorine, caustic soda, and soda ash. The applications for chlorine are EDC/PVC, organic chemicals, inorganic chemicals, isocyanates, chlorinated intermediates, propylene oxide, pulp & paper, C1/C2 aromatics, water treatment and for caustic soda are alumina, inorganic chemicals, organic chemicals, food and pulp & paper, soaps & detergents, textiles, water treatment, and steel/metallurgy-sintering. Applications for soda ash include glass, soaps & detergents, metallurgy, water treatment, pulp & paper, and others. The report is segmented based on regions as Asia-Pacific, North America, Europe, the Middle East & Africa, and South America. Base year considered for the study is 2015, while the forecast period is between 2016 and 2021. 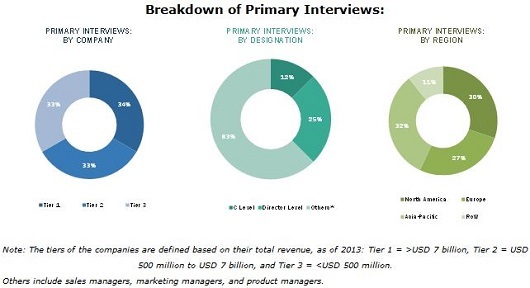 Top-down and bottom-up approaches have been used to estimate and validate the size of the global market and to estimate the sizes of various other dependent submarkets in the overall chlor-alkali market. The research study involved extensive use of secondary sources, directories, and databases such as Hoovers, Bloomberg, Chemical Weekly, Factiva, and other government and private websites to identify and collect information useful for the technical, market-oriented, and commercial study of the global chlor-alkali market. The value chain of the chlor-alkali products ranges from the sourcing of raw materials (salt and limestone) to the delivery of the final product to end-use industries such as EDC/PVC, glass, water treatment, chlorinated intermediates, alumina refining, and glass. The chlor-alkali producers generally have mines for salt from which they get the raw material (salt). The major producers in chlor-alkali market are Olin Corporation (U.S.), Solvay S.A. (Belgium), Tata Chemicals Limited (India), Occidental Petroleum Corporation (U.S.), Axiall Corporation (U.S.), AkzoNobel N.V. (Netherlands), Formosa Plastic Corporation (Taiwan), Hanwha Chemical Corporation (Korea), Tosoh Corporation (Japan), Nirma Limited (India), and Tronox (U.S.). Most of these companies are vertically integrated and they produce products such as EDC/PVC and chemicals. Further, the products manufactured by these companies are used by other industries such as pulp & paper, water treatment, food, and metallurgy. This research report categorizes the global chlor-alkali market based on products, application and region. The global chlor-alkali market is estimated to reach USD 102.60 Billion by 2021, registering a CAGR of 5.4% between 2016 and 2021. The market is driven by increasing demand for chlor-alkali products in the emerging markets and high demand from various application industries such as organic chemicals, inorganic chemicals, pulp & paper, and water treatment. Three products, namely, chlorine, caustic soda, and soda ash characterize the chlor-alkali market. Globally, the chlor-alkali market is one of the largest chemical industries, in terms of both value and volume. The major chlor-alkali products are chlorine, caustic soda, and soda ash. Chlorine is a building block for the plastic industry, as EDC/PVC is used in a host of plastics. EDC/PVC had the largest share among all the applications of chlorine in 2015. Its demand in 2015 was over one third of the global chlorine market. At the same time, isocyanate is projected to be the fastest-growing application of chlorine during the forecast period. The increasing demand from the construction sector and rising demand for chemicals from the emerging markets are the major drivers for growth of the chlorine market. Food pulp & paper had the largest demand among all the applications of caustic soda. The increasing market for the food processing industry is helping the market for caustic soda in food pulp & paper to grow. In terms of value, textiles are projected to be the fastest-growing application between 2016 and 2021. Most of this growth is attributed from the developing regions of Asia-Pacific and South America. With the rise in the container and glass packaging industry, the demand for soda ash in glass applications is surging. Glass application has the largest demand as well as it is the fastest-growing application for soda ash. The demand for soda ash in glass is projected to register the fastest growth rate in Asia-Pacific, as the demand increases from countries, especially from Southeast Asia. 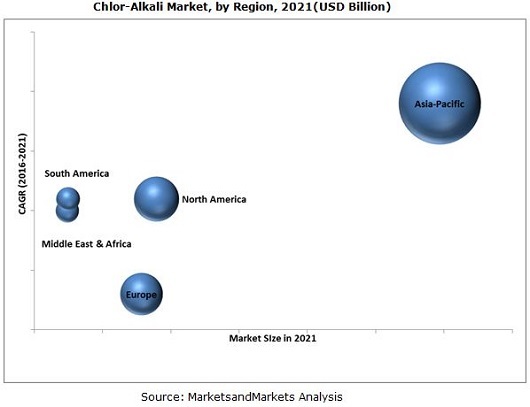 Asia-Pacific is the largest chlor-alkali market, globally. The region accounts for a major share of the chlor-alkali market and is the largest producer of chlor-alkali, globally. China is the largest and fastest-growing chlor-alkali market in the region. With the continuous increase in capacity of chlor-alkali, the country has an upper hand, as the manufacturing costs in the country for chlor-alkali are low. India is another high growth market for chlor-alkali in the region; the country is expected to be a driving factor for the industry in the region. Stringent environmental regulations for mercury emissions have forced the producers to shift to diaphragm and membrane cell technologies. There is an oversupply of caustic soda in the market due to the electro chemical unit ratio. The market players are always in a tight spot of how to balance the demand supply for both chlorine and caustic soda, so that there is not much in their inventories. Solvay S.A. has a global footprint with a wide product portfolio and diverse revenue stream. The demand from the Asia-Pacific market has provided an opportunity for the company to cater to the needs of the region. The volatile exchange rates are affecting the financial situation of the organization. The company’s strong R&D laboratories help it to stay a step ahead of its competitors. It is focused on sustainable development, innovation, and operating excellence. 14.12 Xinjiang Zhongtai Chemical Co. Ltd. Figure 57 European Market Snapshot: Russia Dominates the Soda Ash Market in Europe. Figure 59 Companies Adopted Capacity Expansion and Mergers & Acquisiton are the Key Growth Strategies During 2012-2016.